After the last couple of months' aberrations, it's back to North Wales for December 1978. Here we see 24081 shunting Bangor Goods Yard on 14th December. The Class 24 is on Chester Trip 46, which involved a couple of workings between Llandudno Junction and Amlwch. 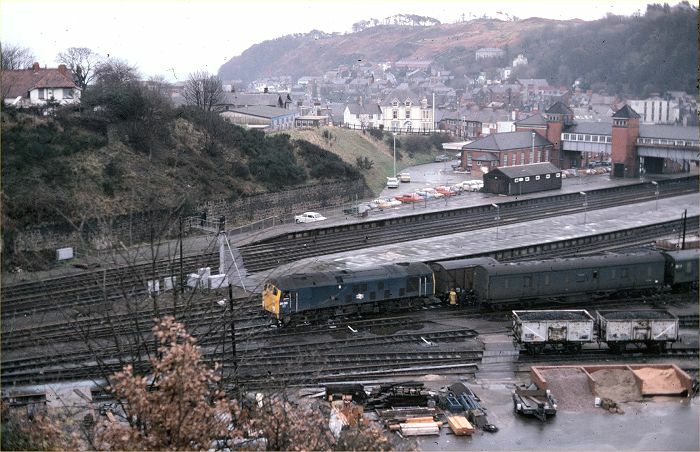 The second of these, seen here, also conveyed trafic for Bangor and Gaerwen goods yards. The loco is shunting one of the two cement terminal sidings - one of the Tunnel Cement 'Presflo' wagons is just visible on the right. In the adjacent and shorter siding, a rake of parcels vans has been left blocking access to one of the coal yard sidings. Two wagons of coal sit in the former oil terminal siding in the foreground, whilst the shunter and guard (leaning on the last parcel van) discuss how they're going to sort all this out. 24081 was one of only 3 class 24's surviving in service at this time; within 4 months it became the only one in service and remained as a 'celebrity' loco until summer 1980, when it was preserved.